The popularity of Wikipedia makes it important that users learn to use the online collaborative encyclopedia as a starting point for their research rather than as the final word, says a Purdue University communications expert. "Students are addicted to Wikipedia, and teachers fight it with stern grading policies and restrictions on its use," says Sorin A. Matei, an assistant professor in the Department of Communication. "But Wikipedia is here to stay and, despite penalties, people are likely to continue using it." 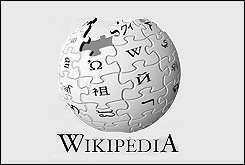 Begun in 2001, Wikipedia is a popular online reference tool that allows Internet users to add and edit entries. Matei recommends Wikipedia be used as a search engine that acts as a springboard to other resources and that it never be cited as a primary source of information. But before starting an Internet search, Matei urges users to consult with a professional who can help focus their research topic. After narrowing the topic, those in an academic environment should then search for more literature on major article databases from institutional organizations, such as ProQuest or LexisNexis. "Many of the papers found on these databases are reviewed by highly qualified individuals and institutions," Matei says. "They are not just very powerful and accessible search engines, they are also excellent filters of information that can be easily sorted by topics, subjects and time." * Read the text carefully. Misspelling or poor grammar in Wikipedia entries could indicate that the information was added by a sloppy contributor. * Check for missing well-known features of a particular story or concept. * Value statements or citations that aren't credited are almost always suspicious. * When Wikipedia entries justify value or factual statements by making reference to specific sources, the authority of the sources should always be checked using a number of criteria, including: Is the source cited from an institutional Web page or a formal publication of recognized academic, research, education or scholarly institution, such as a university, academic publishing house or journal site? Is the source reference complete? Does the source have an author or is it anonymous? * The Wikipedia label "controversial" posted at the top of the article might indicate that the topic has created conflict and debate. * There may be conflict among contributors even if the article is not labeled "controversial." Signs of conflict can be found under the "history" or "discussion" tabs that come with any Wikipedia entry.